Mobile apps need to be increasingly more engaging to succeed. Manatee Works can help. Our mobile barcode scanner SDK is available on all major mobile development platforms. SDK, Sample apps, Trial license keys, Support, and much more! GS1 DataBar (formerly known as Reduced Space Symbology), is a relatively new barcode symbology. As the use of UPC and EAN barcodes matured, retailers and other supply chain members sought the ability to represent even more data and in a smaller area. Further, the number of available UPC and EAN codes began to run out in the 1990’s. These factors led to the development of Reduced Space Symbology, or RSS. The initial specification for RSS was released in 1999 by AIM, the Association for Automatic Identification and Mobility. In 2007, GS1 officially adopted its use for supply chain members, renaming it GS1 DataBar. DataBar is a linear, or one-dimensional (1D) barcode. 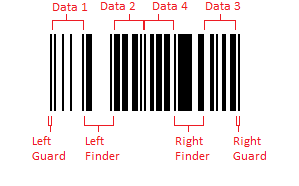 This means that data in the barcode is represented by the varying width and spacing of a set of parallel lines (or bars). DataBar barcodes come in several different formats (e.g., standard, stacked, and expanded). The most common of these will be discussed later. DataBar is highly efficient as compared to UPC and EAN. 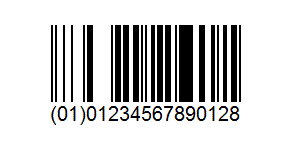 The standard DataBar symbol, called DataBar Omnidirectional, can represent 14 digits in less than half the space required for a complimentary UPC/EAN code (which are only 12 or 13 digits). Another important characteristic of DataBar is that it permits omnidirectional scanning in most of its formats. 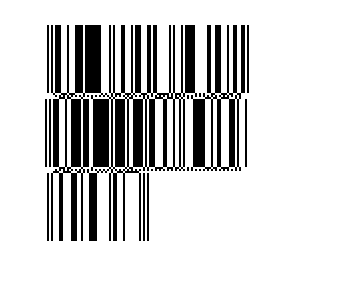 This means the barcode symbol can be scanned in any direction (forward or backward) without regard to the specific orientation of the barcode to the scanner. Omnidirectional barcode scanners are most commonly found at checkout counters. The right guard pattern (two modules). Other, more traditional linear barcodes (e.g., Code 11, Code 25, Code 39) have a direct relationship between the data digits being encoded and bar/space patterns used. That is, for each digit 0-9, there is a specific, unique bar/space pattern for that digit. DataBar, though, employs a sophisticated data encoding and compaction technique: there is no one-to-one correspondence between the digits stored in the barcode and the bar/space patterns of the data characters used (after all, DataBar is encoding 14 digits with just 4 data characters). This also means that some software algorithms need to be used to encode and generate a DataBar symbol; it cannot be generated with just check digit computation and a font. The specification for DataBar Omnidirectional requires that symbol be at least 33 modules in height to support omnidirectional scanning. Like DataBar Omnidirectional, each row must be at least 33 modules high to allow for omnidirectional scanning. Note that DataBar Stacked Omnidirectional barcodes typically appear without the printed digits of the GTIN to conserve print space. The bottom row must be at least 7 modules in height. DataBar Limited has a minimum height of 10 modules. Unlike the other DataBar formats previously discussed, DataBar Expanded is variable length and alphanumeric. DataBar Expanded was designed to representing a GTIN-14 with supplemental data (like product weight, “best by” date, serial number, etc. ), and yet still be scanned by properly configured point-of-sale, omnidirectional scanners. DataBar Expanded also uses sophisticated data encoding and compactions techniques, again requiring some software algorithms to encode the data message and generate the barcode symbol. The minimum height of a DataBar Expanded symbol is 34 modules. 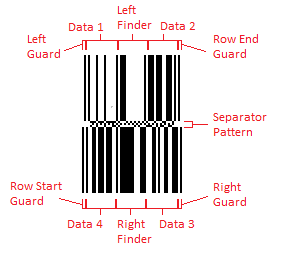 Similar to DataBar Stacked Omnidirectional, adjacent rows of a DataBar Expanded Stacked barcode are separated with a 3 module high separator pattern and each data row must be at least 34 modules in height. Coupons – manufacturer coupons have been using GS1 Databar barcodes in the US for years. How do we help developers using DataBar? The Cognex Mobile Barcode SDK supports DataBar detection, enabling developers to gather relevant workflow and application data. You can download the SDK for free by registering on the Cognex Mobile Barcode Developer Network. Packaged with the consumer product barcodes of EAN, UPC, and QR Code, the SDK Consumer Developer License (CDL) lets you deliver a powerful retail experience quickly and easily. In addition, the Barcode Scanner SDK supports a broad range of symbologies to meet your growing development needs. Developing practical applications is challenging. That’s why we've developed a straight-forward barcode scanner software development kit (SDK) that boasts the most powerful scanning experience available for integration. It offers developers a simple, flexible, dynamic decoding experience, while still allowing for maximum control and flexibility over the user experience (UX). The Cognex Mobile Barcode Scanner SDK was built BY developers FOR developers... with the goal of making all your applications practical. As a tool developed with the retail, manufacturing, government, healthcare, commercial services, and transportation industries in mind, our scanning solutions are built around efficiency for the end-user, as well as simplicity for the application developer. We understand that the enterprise is continually looking for opportunities to increase efficiency. Therefore, we have developed the ultimate single-handed scanning solution aimed at maximizing every promise of a return on investment. Get the app! Download the Barcode Scanner app by Cognex Today.